Rise Up and Come Out Church: PROPHECY:President Kamala Harris Christian Socialist Woman President After Trump Reparations! PROPHECY:President Kamala Harris Christian Socialist Woman President After Trump Reparations! Kamala Harris is going to have some serious problems running for President to get the Black vote. If the Democrats cant win over So called Blacks, they can't win an election- PERIOD POINT BLANK!! The Black Voting Boycott is still on, and this is why Democrats lost to Trump for putting out a Ku Klux Klan candidate who helped to implement anti- Superpredator laws against Blacks, Latinos, and Native Americans during her husband's administration. Kamala is now the Ku Klux Klan Candidate. She's a TOP COP who has bonafides in prosecuting Blacks, Native Americans, and Latinos. She would have been a perfect Typical Racist Republican Candidate. She's a Black Woman with a JD, and a harsh record as a prosecutor and attorney against minorities. A Perfect Republican. Does she vote for Republicans? She sure sounds like someone who should. Then again, most Baby Boomer Blacks sound like Republicans when they talk, but they vote for Democrats. Black Baby Boomers being right of center is the reason why the Democrats are a fail party. How are you fighting the Devil, when you not only sound like the devil, but you are fully participating with and operating like the devil? IS KAMALA HARRIS OUR DEBORAH? The whole black men in prison thing was ultimately to turn factory workers into hardened criminals so when SHTF they can release them from prison and have them engage in all kinds of purging and death marches. Was Kamala just helping this process along so when SHTF, prisoners can be released and used as: monsters, bots, agents, and warriors by certain elites? SACRAMENTO – A funny thing is happening on the way to United States Sen. Kamala Harris’ coronation as the Democratic presidential nominee. Her long and controversial prosecutorial record as California attorney general and San Francisco district attorney is catching up to her. Progressives have noticed that Harris, now re-inventing herself as a criminal-justice reform champion, behaved in a decidedly non-reform-minded way when she had the power to effect change. This criticism shows how far the pendulum has swung away from the law-and-order policies that had dominated politics for decades, even in our liberal state. For years, aspiring politicians from both parties vowed to be as tough as possible on crime. The apex of this frenzy came in the 1998 gubernatorial election, where the two candidates tried to out-tough each other. The winner, Democrat Gray Davis, even said publicly that Singapore, which executed drug dealers, offers “a good starting point” for law-enforcement issues. In the 1990s, Harris was an assistant prosecutor in San Francisco and dated that city’s flamboyant mayor and former Assembly speaker, Willie Brown. She apparently embraced the conventional wisdom of the time. If one has grand political ambitions, one must cozy up to the police unions and take unyielding positions on crime and punishment. Crime rates had started their long and precipitous fall by then, but the fear of crime was still motivating voters. In the ensuing years, Harris became a darling of the political left. As state attorney general, she prosecuted the undercover videographers who published videos allegedly showing Planned Parenthood officials discussing the marketing of the body parts of aborted fetuses. She used her power to force a conservative nonprofit foundation to turn over its private donor lists. She ensured the death of a pension-reform ballot measure by giving it a biased title and summary that sounded like a union boss had drafted it. In the meantime, many progressives — and even some conservatives — had begun to push back against a justice system that has tilted too far in the direction of the government. Sentences, even for relatively minor crimes, had become extreme. Prosecutors ladle on so many charges that innocent people sometimes plead guilty to avoid decades in prison. Poor people accept unfavorable plea deals because they cannot afford bail, and are desperate to get back to their jobs and children. People wrongly accused of crimes languish in prison even when exculpatory evidence later emerges. Prosecutors use civil forfeiture to take the property of people who haven’t been convicted or even accused of a crime. As Reason magazine’s Ed Krayewski wrote, “During her time as San Francisco’s district attorney, Harris oversaw the city’s mismanaged crime lab. A San Francisco Superior Court judge ruled that the DA’s office ignored demands that it take responsibility for the lab’s failings, and that it violated defendants’ rights …” Furthermore as AG, “Harris challenged the release of a man who had been exonerated by the Innocence Project and had his conviction overturned.” Despite her recent revisionist history, many others have noted that Harris opposed a long list of proposed sentencing and criminal-justice proposals. At least she finally sees which way the wind is blowing. Harris also promoted policies that ramped up the power of police and prosecutors to imprison more people, including an Orwellian anti-truancy campaign that finally is getting much-deserved scorn. 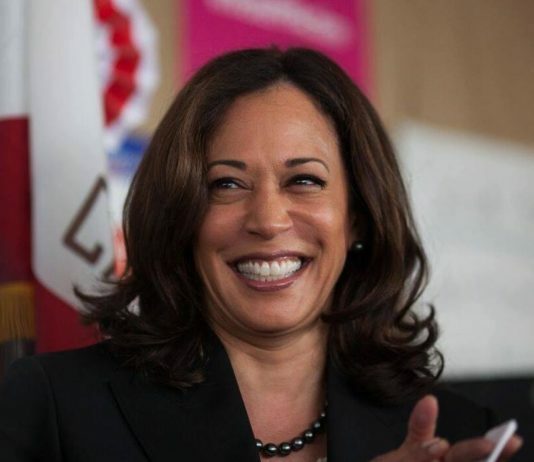 The left-leaning Guardian recently reported on a video of Harris at the Commonwealth Club in San Francisco in 2010, where she lightheartedly boasted about prosecuting the parents of truants and about using her “huge stick” as a prosecutor. Sen. Kamala Harris (D-CA) said in an interview Monday with “Breakfast Club” that she supports “some type of” reparations to black Americans for slavery. “Where do you stand on some form of reparations for black people? Here you see Mayor De Blasio said the marijuana economy could be a form of reparations. Marianne Williamson says black people should get a hundred billion in slave reparations–like, where do you stand on it?” Charlamagne asked. Those were all Democrat policies! Democrats should pay the reparations. The far-left California Senator said that the people didn’t start out on the “same base.” She wants a ‘Lift Act’ which lifts people up who make less than a HUNDRED THOUSAND DOLLARS A YEAR. She’s talking about universal income — a Communist policy. “Yes I am, yes I am,” Harris responded. This is a big issue with Democrats as a payback for their votes. Obama wanted it and it has been brought up continuously since. Now it’s back. The woman is for everything hard-left including the crazy Green New Deal.